You are here: Home » Blogging » Is this Neighborhood Headed Up? Or Down? When searching for a loft on a budget, you’ll often find great deals on the edge of up-and-coming neighborhoods. But how do you tell if a neighborhood is headed up? Or, if it’s on its way down? Of course, the first consideration might be financial: Are the loft prices going up but still affordable? Are the taxes reasonable but enough to support great infrastructure and schools? Are there places to shop for essentials like groceries? 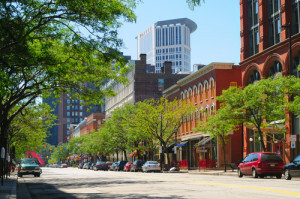 More than the financial considerations, however, you need to be clear about the neighborhood’s livability … that is, does it offer the quality of life you’re looking for? Will you enjoy living there? Can your family form an emotional connection to the neighborhood? There are several signs to look for in a neighborhood that point to its becoming the next hot area. Proximity: One of the first things to look for is access to public transportation or easy-to-reach major roads. Young professionals and families want affordability, but need accessibility to jobs, restaurants and entertainment, and medical facilities. Find a trendy neighborhood, and then visit two freeway exits or two transportation stops past it to spot an emerging neighborhood. Neighborhoods adjacent to trendier or more gentrified ones may be next for growth. Convenience: In larger cities and denser metropolitan areas, even a neighborhood that appears subprime may be on the verge of urban renewal. Check with city offices to see if an area has been reclassified as an enterprise zone or if there are special tax breaks for new businesses. If the neighborhood is convenient to shopping, workspace and public transportation it may just be the next hot area. Low crime rates: when an area is on a positive growth trajectory, crime rates will trend downward. When the general safety of an area increases, that is a sign that the neighborhood is attracting young families, first-time buyers and even more single women. Use a website such as Crime Reports to check for criminal activity. Gentrification: One of the first signs that a neighborhood is trending upward is a larger population of artists, musicians and other creative residents. Often, when artists settle in an area, restaurants, galleries, music venues, farmer’s markets and other desirable amenities soon follow. A thriving music or art scene in the Hudson Valley in upstate New York, for example, has attracted a green economic revitalization that mixes art culture with sustainable agriculture, and the thriving music and film scene on the east side of Austin, Texas is a magnet for both young professionals and empty-nesters. Prized architecture: When an older neighborhood has significant historic architecture, there is more likelihood that it will experience a renaissance. As you drive around a neighborhood, look for signs that historic buildings and older houses are under reconstruction or remodeling. Areas with a large number of warehouses that are being repurposed into office, residential or live-work space are great indicators. Retail, restaurants and recreation: When large retailers, restaurants, grocers and even coffee shops invest in an area, that is a prime indicator that the neighborhood is trending up. After all, these companies invest millions of dollars in research before investing in an area. In fact, when the retailers are ones that appeal to more affluent residents (Whole Foods, Starbucks, etc.) studies show that property values nearby can increase dramatically. In the same vein, a popular bar, night spot or consistently crowded restaurant points to a positive trend. As your real estate professionals, we can help you find properties in growing areas, or those on the verge of a turnaround. The more we know about what you’re looking for, the better we can help you find it. Call us today to get started finding the perfect neighborhood for your family.